Over the weekend James took four friends to the Carnegie Science Museum for the afternoon to celebrate his tenth birthday. They returned home at supper time for pizza and birthday cake. It was a great way to celebrate being ten years old! And since the kids had already been in the kiddie pool this year, we were all shocked by the return of winter. Field trip was postponed, and we made it out to Fort Ligonier a couple days later. The kids had a great ime exploring the fort with their friends. Volunteers were in costume to relate historical events. The kids participated in many activities including drilling and marching. Henry was so excited to get to march with a rifle. And look at the difference in weather from two days prior! Malcolm was content watching all around him. Making a Native American Necklace. Sometimes I forget all our area has to offer in terms of field trips. It is so easy to get into a mind-set that we have too much going on to participate in these events. The kids had such a good time! My little guy is getting a molar and his gum is actually purple. He is my fifth to get his 18 month molars, and I have never noticed purple gums before. I feel so bad for him. Just to show how completely miserable Malcolm is, I decided to share these photos of Margaret singing a song in one of her various wardrobe choices. Usually songs make Malcolm happy, but not this time. Notice those plastic high heels? Look at those cute little feet! I love it when he plops down like this. My life got a whole lot better ten years ago today. Happy Birthday to the sweetest ten-year old I know! James was lucky enough to be born on my Grandma's birthday. If you have never been to a Great Homeschool Convention, I HIGHLY recommend that you go. It was a weekend filled with talks, browsing through homeschool materials, and good laughs with friends. Look at all those vendors! In three days I only saw a fraction of them! If you use Institute for Excellence in Writing then you already know why this photo TOTALLY ROCKS! My head whipped around when I heard the voice that fills my schoolroom on an weekly basis. Meeting Andrew Pudewa was like meeting a movie star and was a highlight of the weekend. He is such a fantastic speaker! The conference in Cincinnati is right in downtown and located blocks from a microbrewery. Saint Xavier Church was soooo beautiful inside. Street Art. A soccer player made out of drink bottles. Sleepy Man Banjo Band. Click the link. You will be so amazed! Now lots of folks were there with their families. But it was much more fun to go without kids so that you could end your evenings like this. We have been using materials from The Critical Thinking Co. for a while now. We especially love their Building Thinking Skills books and the Mind Benders Series. I didn't even know they had materials for mathematics until I was offered this review. I really appreciated how simply the book was laid out. Problems are easy to see and understand. Hints are offered in the sidebar. Solutions are in the back. I personally loved algebra as a child. I thought of it exactly as the book presents it: a series of puzzles to be solved. Although I loved the subject, I didn't have a clue how I was going to teach it. 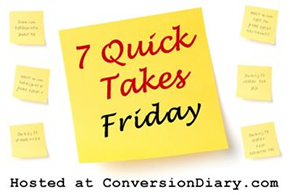 This book is so clear-cut and obvious, it almost made me feel like I was cheating! I really liked this book because it was like I was solving puzzles and it wasn't like I was learning math at all. Balance Math Teaches Algebra is available on The Critical Thinking Company website for $14.99. As mentioned above the company offers many other products for all age and ability levels from pre-kindergarten to adult. tools to explore our world. And there is no better way to start exploring the world of science than with Amazing Science, Volume 1. This two-disk DVD set contains 23 experiments on topics such as Heat, Electricity, Magnetism, Chemistry, and Physics﻿. Using easily accessible materials, the experiments are demonstrated and explained so that every concept introduced is understood, and every experiment can be recreated in your home. I'll admit that I was skeptical at first about how effective a DVD could be for teaching science, but I was quickly shown the error of my ways. Imagine you hire a science professor to come to your house to teach your kids science. This guy is energetic, fun, and can effectively teach a wide-range of levels and abilities. Amazing Science, Volume 1 is your own private science tutor! The kids had a blast watching the videos and then going downstairs to try out the experiments. The best part for me was that the materials were truly things you had around the house, and there was little or no advance prep time required from me. So many times I have wanted to get some science done only to find out that we are missing this important ingredient or that I needed to have done something the night before. Now I can really squeeze in some science when we have some extra time. I thought this was really cool and with the milk experiment you could make it look like a different universe. I liked this very much and I liked how we gets the Q-Tip with some soap and then it turned into something. I thought it was really fun and it was interesting to learn experiments that weren't boring. I thought the DVD was interesting and the experiments were really exciting. I liked how the milk experiment was really colorful and beautiful. I also liked how when you were done with the milk experiment then you can stir it and it will have swirls in it. 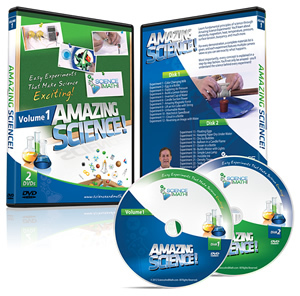 Amazing Science, Volume 1 is available from the ScienceandMath.com website for $19.95 for the 2-disk DVD set or $17.99 for an instant download of the program to your computer. Although Volume 2 is not yet available, there are many other math and science courses available on DVD. Check them out on their website. We've been busy at Ab Initio Academy here in Kromville. It is the end of the year and we are begining to finish stuff up. Here's our youngest scholar in some new duds from his Godparents. We took a field trip to the Johnstown Flood Museum and Heritage Cultural Center. The best part for Henry was definitely the Children's Museum located in the Cultural Center. Ahh, the volcano experiment. What homeschooling family hasn't done this at least a gazillion times? This is our third or fourth volcano in as many years. Same results every time. Consistency always brings smiles. Margaret is really getting into school and loves to do her school work. Here is a narration she completed after listening to a chapter in a Percy Jackson book. An octopus for Letter O week. It has some of it's arms behind it's head while it rests. This is truly impressive to me. We have started nothing formal in terms of writing, but Margaret can successfully copy most of her letters and numbers. Perhaps the boys could do this at four as well. I don't really remember anything that happened past last week. You know, you just never know with these kids. One week they are begging, literally begging, to do nothing but nature drawings. I have to go to Walmart RIGHT NOW to get more clipboards and pencils so they can spend their lives creating drawings of nature. Then today~ WHAM! It is like pulling teeth to get them to complete one drawing. Since we still only have one clipboard, they each had to wait their turn to create their drawing. Time it took for all the drawings to be completed: one minute 42 seconds. Saints they are not. But we're trying. Boy are we trying.